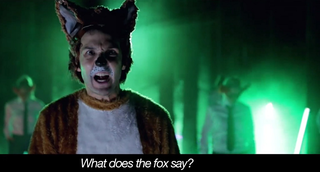 Acceptable Answer: What Does The Fox Say? Welcome to Acceptable Answer! The only place where you can show your fellow TAYers just how hilarious you really are! Here's how to play: in the comments section, submit your funniest, wildest, but totally safe-for-work interpretations of the day's topic with a GIF, image, or text. Then, discuss, riff, and comment to help make those submissions even funnier! Today's Topic: What Does The Fox Say?